You have questions about the different locations, or even a concrete event in your head? Write us - we look forward to supporting you in your project. 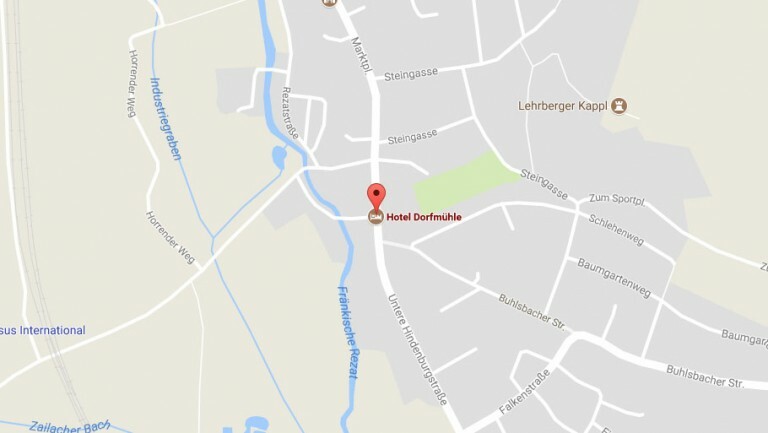 The Hotel Dorfmühle is located amidst the Frankenhöhe nature park, in the heart of the typical Franconian town of Lehrberg. Located directly on the B13, with the A6 and A7 it is optimally connected to two motorways that connect it with the cities of Nuremberg and Würzburg. But if you prefer to travel by train, we will gladly pick you up from Ansbach station. Hotel Dorfmühle Untere Hindenburgstr. 22 91611 Lehrberg. The village mill is located in Lehrberg on the Franconian Rezat near Ansbach, but: the Franconian metropolises of Nuremberg, Fürth and Erlangen can be reached in just 60 minutes by car. This is not really too far for a relaxed brainstorming session or a conference in an unusual environment.